Tech Edge sells a number of wideband sensors that work with our own controllers. We also sell sensors that work with other manufacturer's controllers - such as the LSM-11 that works with the Autronic controller, and the 6066 that works with the MoTeC controller. Go here for the main LSU sensor page which describes sensors we don't sell. Some of our controllers work with the NTK UEGO range of sensors. We DO NOT sell any NTK sensors. Go here for WBo2 connector kits, or LSU connector wiring info. Another important topic is correct sensor placement for best results and longest sensor life. We also have info on how wideband pump cell sensors work. We sell M18x1.5 sensor bungs too. Our controllers work with 5-wire Bosch LSU sensors. Note (*): The 7057* sensor is an older version of the 7200. If you order the 7057* we will ship the 7200 sensor. Go here for to purchase sensor-to-controller cables and further cable information. The lead lengths of 5 sensors Tech Edge sells is shown in the image at right. The full part numbers for these sensors, and other NTK sensors is shown below. LSM-11 -- Bosch # 0 258 104 002 - Legacy, narrowband 4 wire sensor! The four sensors 6 066, 7 057/, 7 200 & 17 123/5 are Bosch LSU wideband pump cell sensors. They are described in more detail in the special LSU section and they are all sold by Tech Edge. WBo2 was specifically designed around the LSU sensor and all relevant Bosch operating conditions (including the exacting "light off" warm-up characteristics) are rigorously observed. The 06 066 sensor is normally called an LSU 4.0 (although some documentation calls it an LSU 4.2) , and the 07 057 & 07 200 are LSU 4.2 variants. The 17 123 and 17 025 are LSU 4.9 sensors which is designed to work well in diesel and lean burn applications. One major difference between these sensors is the "head" design that is fairly open in the 6066 but is more restricted in the 7057 & 7200 sensors. An open head results in faster Lambda sensing, but also make the internal pump cell more sensitive to exhaust gas temperature variations, with the possibility of over-heating or under-cooling if the sensor is located closer of further from the optimal position. In general, we recommend the lower cost 7057 & 7200 over the 6066. Another important difference with these LSU sensors is the connector itself. The flat 6 pin 6066 is different to the 2 by 3 pin rectangular 7057 & 7200 connector. More connector information here. 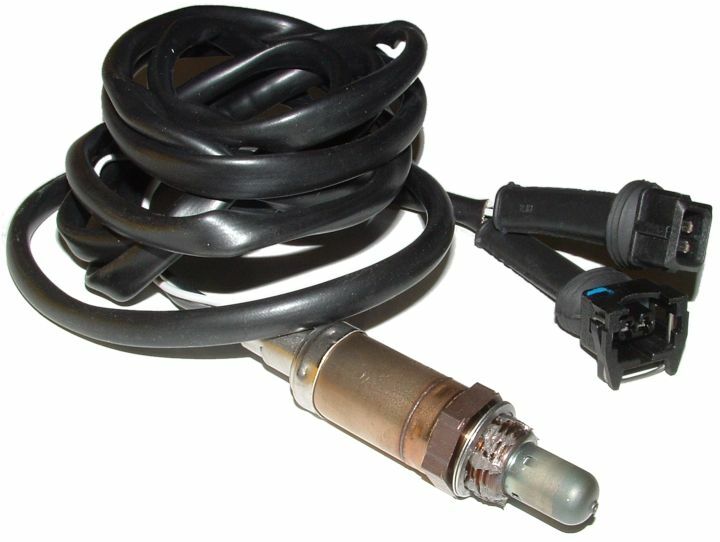 The L1H1, L2H2 & NTK-VW sensors are NTK/Honda UEGO wideband pump cell sensors. The name UEGO is traditionally associated with this range of sensors, and stands for Universal Exhaust Gas Oxygen. They were co-developed by Honda & NTK (the speciality ceramics division of NGK) and first appeared in the early 1990s on Honda 1.5 Litre engines. Heere's some more information relating to the older Tech Edge1.5 unit the L1H1 sensor. They predate the Bosch LSU sensor but, apart from the higher price Honda seems to want to maintain, are still good sensors. Just to confuse you, Bosch source the L1H1 sensor from NTK and package it as their (USA 5-digit part number) 13246 sensor. Are NTK sensors better? Tech Edge does NOT sell and has NEVER sold the L1H1 or the updated L2H2 NTK sensors. We believe that there is still a lot of incorrect and misleading information floating around about these, now quite old, NTK sensor designs. The misinformation suggesting they are superior and more accurate than the Bosch sensors. We believe that back in 1995, when Bosch had their 4-wire narrowband sensor they called a wideband, and Honda/NTK had their very expensive L1H1 design, there may have been a glimmer of truth. But by 2005, with sales of Bosch 5-wire sensors exceeding those of NTK by orders of magnitude, it was clear the rumours had been quashed. Remember that the version 1.0 and 1.5 Tech Edge units described in the next link use a design that is over 10 years old (as of 2010). We still have many happy customers who still use our original units. But remember that any of our designs we have produced since 2003 that use the Bosch sensor will be more accurate, more readily repairable, and replacment sensors are inexpensive compared to these old designs. There is more L1H1 information here. Tech Edge also sells the LSM-11 (Bosch part #0 258 104 002). This sensor is not a wideband sensor (in the true sense of the pump cell sensors) but has been used with controllers described as wideband controllers. Here is some Bosch on-line information on the LSM-11 (PDF format). Many older "wideband" controllers use the LSM-11 including Autronic and MoTeC controllers. Tech Edge sells the LSM-11 only because there is a demand for it from users who have legacy equipment. We don't recommend people use this sensor when accurate and robust LSU sensors are now so inexpensive, often costing one fifth the price of the LSM-11. 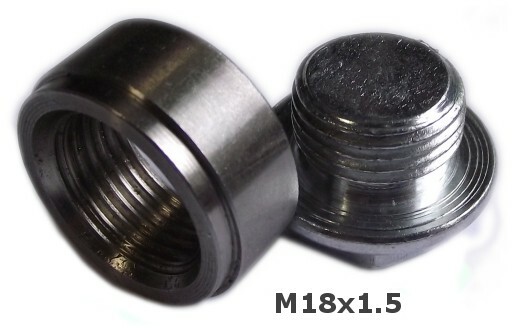 Most oxygen sensors, either narrowband or wideband, use the metric M18 thread size with a 1.5 mm/turn pitch (called M18x1.5 thread). We sell a weld-in adapter, which is often called a bung; it is a mild-steel sleve that is welded over a hole cut into an exhaust pipe. Our bung comes with a stopper with a 19mm hex nut top, that is used to protect the bung's threads during welding and when the sensor, which is normally in the bung, is removed and the bung-hole must be closed. Our bug is designed to fit into a 25mm hole in an exhaust (it has a 26mm outside diameter and a 24.5mm lip at the weld end). It has a finished height of 10mm above the exhaust with a total height of 11.8mm (ie. the lip is 1.8mm deep). More information on how 5-wire sensors work can be found here. Here is the main LSU page. Advanced LSU info here.